Grammy and Emmy Award winner, Tony Award nominee and multi-platinum recording artist Harry Connick, Jr. will return to Boston this Spring for 5 performances only at Boston’s Colonial Theatre. 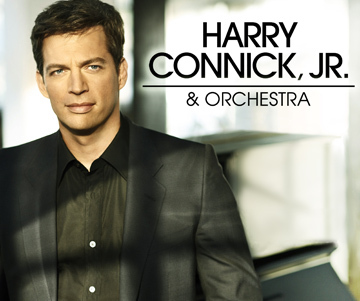 Playing a limited run from April 26 - 30, Harry Connick Jr. & Orchestra is part of the Lexus Boston Area Dealers Broadway Across America – Boston Series. Connick comes to The Colonial direct from his 15 sold-out performances on Broadway at the Neil Simon Theatre. Of his Broadway run, The New York Times said, "Harry scores a knockout" with Variety adding, "Dynamite. Easily the most remarkable demonstration of musicality presently on display on Broadway." No stranger to the Broadway stage, Connick received Tony nominations for both his performance as Sid Sorokin in "The Pajama Game" and for the music and lyrics he composed for "Thou Shalt Not." Over the past two decades, Harry Connick, Jr. has earned a place among the entertainment world’s most successful and multi-talented artists. While he first reached a mass audience as a pianist, singer and bandleader, his subsequent success in film, television and theater have secured his place in the public eye as a renaissance man and versatile entertainer. Raised in New Orleans, Connick first performed publicly at age five, appeared on his first recording at age ten and released his self-titled major-label debut on Columbia Records at 19. Since then he has recorded more than 24 albums which have garnered sales of over 25 million and is ranked among the top best-selling male artists in the United States by the Recording Industry Association of America. His most recent album, “Your Songs,” was released on Columbia Records in 2009, featuring his versions of 14 classic popular songs. His film credits include "Memphis Belle;" "Little Man Tate;" "Copycat;" "Independence Day;" "Hope Floats;" "My Dog Skip;" "The Iron Giant;" "The Simian Line;" "P.S., I Love You;" "New in Town;" "Mickey;" "Bug;" and "Living Proof." He also contributed music to several films including "When Harry Met Sally" (leading to his first multi-platinum album), "The Godfather III" and "Sleepless in Seattle." On television, he has been seen in “When My Heart Finds Christmas” on CBS and “Harry for the Holidays”on NBC; two Great Performances (PBS) specials: “Swingin’ Out Live” and “Harry Connick, Jr.: Only You in Concert;” “The Happy Elf;" "South Pacific;" and on the long running NBC series “Will & Grace” on which he played the recurring role of Dr. Leo Markus.